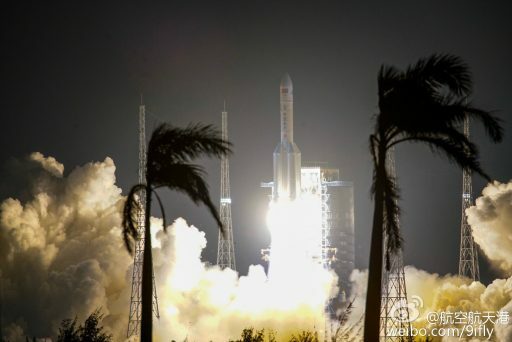 Chinese launch controllers took to social media after last week’s successful inaugural launch of the Long March 5 rocket to recount a dramatic chain of events leading up to liftoff that were not visible to outside observers at the time. 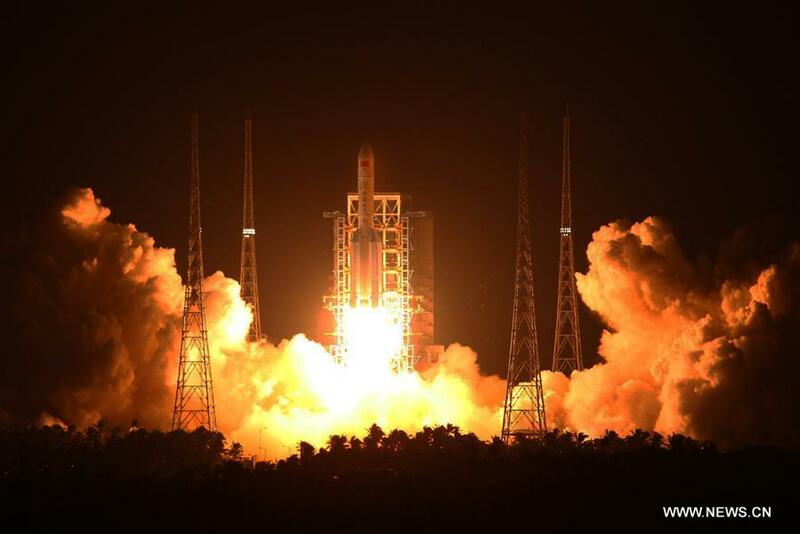 Thursday’s maiden launch of the Long March 5 was, by all accounts, a success – demonstrating China’s largest rocket and delivering the Shijian-17 experimental satellite to its target orbit, roaming over 36,000 Kilometers above the equator before settling in its operational slot. However, like the rocket’s decade-long development, Thursday’s countdown was anything but smooth. CCTV Video showing the dramatic events of the last minute of the countdown when a late hold is called in the launch sequence. The launch of the 57-meter tall heavy-lift rocket had been awaited with great anticipation to put China’s launch vehicle fleet on-par with industry leaders like the American Delta IV Heavy, Europe’s Ariane 5 and the Russian Proton which the CZ-5 either matches or surpasses in terms of performance. 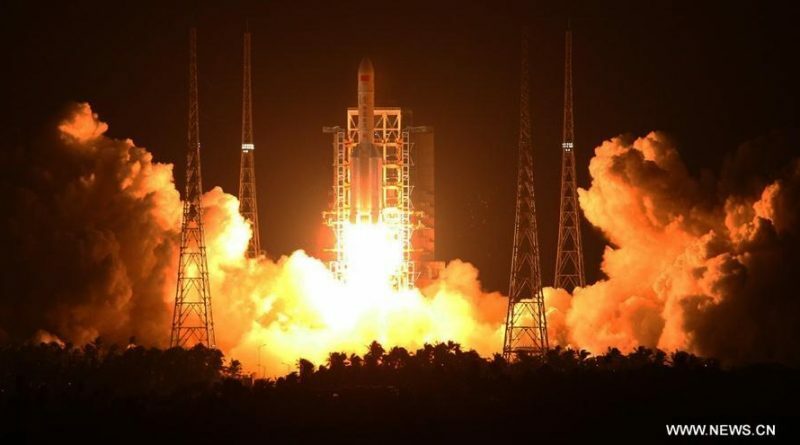 A lot was riding on the success of the inaugural flight of the rocket as the schedules of a number of high-profile projects hinge on the rocket’s availability including the construction of China’s large space station, the Chang’e 5 lunar sample return and the country’s first attempt of landing a rover on Mars – all planned in the next five years. 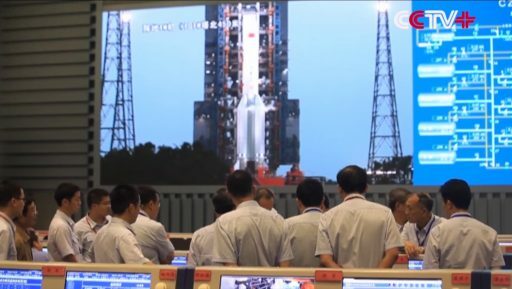 In a deviation from standard secretive behavior, China provided detailed behind-the-scenes accounts from the historic first mission of the Long March 5, coming via China’s CCTV news channel as well as Social Media where launch controllers shared their view of the dramatic run-up to the mission. Long March 5 was wheeled from its Assembly Building to the LC-101 launch pad on October 28 for one week of checkouts and launch preparations. Problems first emerged during an October 30 Mission Dress Rehearsal during when it was discovered that the launch table was not precisely positioned on the launch pad. In the final run-up to the mock T-0 time, the Thrust Vector Control System on the rocket’s four boosters malfunctioned and deflected their engines to their maximum angle – a condition that can, and has caused problems on other rockets in the past. 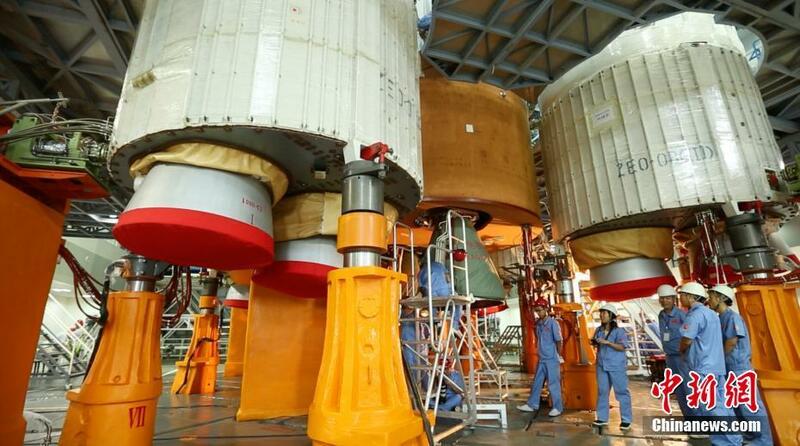 Fears arose that the boosters may have to be returned to the manufacturing plant in Tanjin, threatening to delay the launch by months. However, the engine deflection remained without consequences and Long March 5 was cleared for its November 3 launch after a clean Launch Readiness Review. Liftoff had been set for 10 UTC, the start of a two-hour and 40-minute launch window extending until 12:40 UTC. Still with seven hours to go until the planned liftoff time, the countdown entered its first unplanned hold when indications were received that Liquid Oxygen was leaking from two of the four Kerosene-LOX-fueled boosters. T-0 was re-set for 11:01 UTC after it was verified that no leaks were present and Long March 5 pressed on with its cryogenic tanking sequence – filling the four boosters with LOX and loading Liquid Hydrogen and Oxygen into the two-stage stack. Under 90 minutes to the revised T-0 time, a new problem cropped up when the temperatures of the twin YF-77 core stage engines showed their turbopumps were not being chilled down properly. For smooth operation of the pump bearings, the engines are cooled down to 100 Kelvin or below prior to start-up using the supercold propellants of the core stage. However, temperatures only reached 140K and the countdown had to be stopped at T-1 hour. At that point, teams were about to call a scrub – propellant topping was stopped and cars were seen pulling up to the launch pad to put the scrub procedure into motion. Engineers were summoned at 11:30 UTC for a final review of the situation to assess whether launching in the window was possible. By that time, the payload team reported that extending the launch window to 13 UTC was possible and a new navigational warning was quickly issued to ensure the no-fly zones for the mission would remain in place. Propulsion specialists worked to resolve the chilldown issue by commanding engine valves to allow the supercold propellants to reach the pumps. Just around the 11:30 UTC deadline, teams were able to resume the chilldown, seeing a favorable trend in engine temperatures to resume the countdown with a T-0 set for 12:40 UTC. Heading into final preparatory steps inside one hour to liftoff, the launch team hoped they had seen all problems but were proven otherwise when the count passed T-10 minutes and error messages were popping up on controller’s screens due to transient data drop-outs from the rocket. The team took the countdown to T-3 minutes, held briefly, and again held the clock for less than one minute at T-2 minutes. 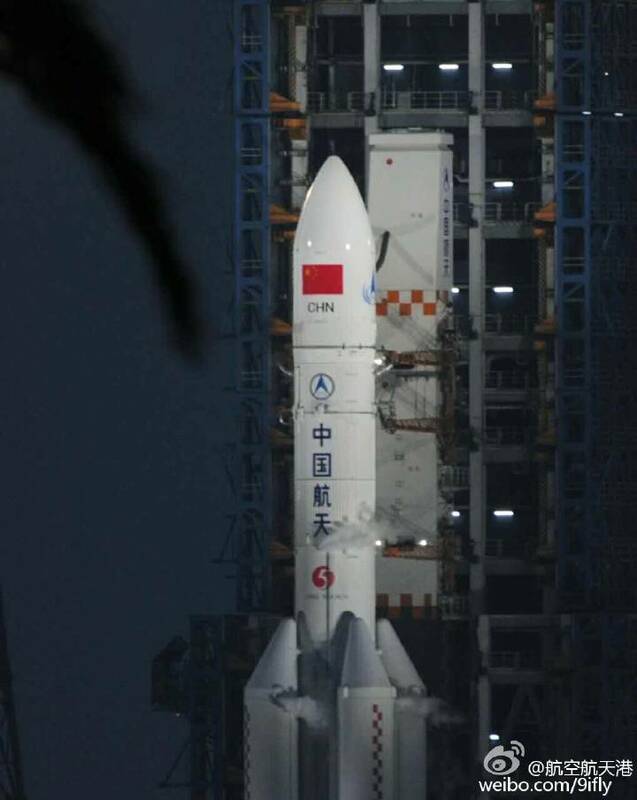 Long March 5 was transitioned to battery power which was followed by an alarm and a call to ‘Please Suspend the Launch’ right at the one-minute mark. Video from the control center shows engineers standing up on their consoles, working the problem in real time as available window time was fading fast. Eventually, a GO to proceed was given and the final ten seconds were counted down in Chinese, setting up for the ignition command when clocks hit zero after a tumultuous countdown. 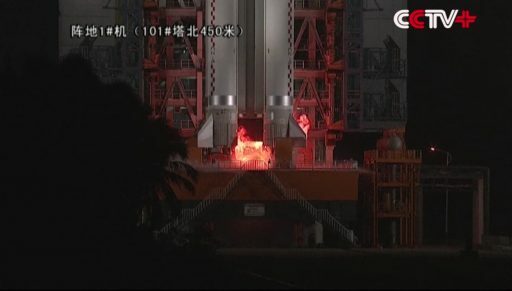 Red flames erupted from the base of the Long March 5 when the twin YF-77 cryogenic engines soared up for a brief moment of performance monitoring prior to ignition of the boosters and their eight YF-100 engines, catapulting the rocket off the pad at 12:43:14 UTC with a thrust of 1,078 metric-ton-force. With the rocket on its way, all that was left for the launch control team was to watch its progress, swinging onto a south-easterly trajectory to deliver the Shijian-17 satellite directly into a Geostationary Orbit. The four boosters helped accelerate the vehicle to 2.7 Kilometers per second, dropping away from the five-meter core stage 173 seconds into the flight. The fairing separated four minutes and 45 seconds after liftoff at an altitude of nearly 150 Kilometers and the two YF-77 engines fired until 471 seconds into the flight before the cryogenic second stage and its twin YF-75D engines assumed control of the flight to lift the vehicle into a Parking Orbit. The flight appeared extremely smooth and some controllers openly wondered how it could fly like this after such a bumpy countdown where even the contact liftoff signal did not make it to the ground controller to verify launch had taken place. Nevertheless, Long March 5 arrived in its Parking Orbit as planned and re-started its second stage for the boost into a Geostationary Transfer Orbit. According to reports posted on Chinese forums, the second stage shut down 11 seconds earlier than planned, requiring the Yuanzheng-2 upper stage to make use of excess performance to compensate by extending its first of two engine burns. YZ-2 performed admirably and completed the GTO-injection followed by five hours and 36 minutes of coasting ahead of re-starting the engine to circularize the orbit and insert Shijian-17 into a Drift Orbit above the Geostationary Belt. For the Long March 5 team, celebration began after the successful separation of YZ-2 when the job of the most complex rocket ever built in China was complete. 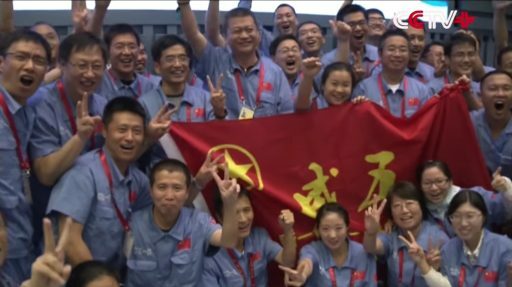 Teams will not be able to rest on their laurels for long as plenty of work lies ahead to ensure future Long March 5 missions can enjoy a smooth countdown to more timely launches – a critical requirement to meet interplanetary and Low Earth Orbit launch windows. 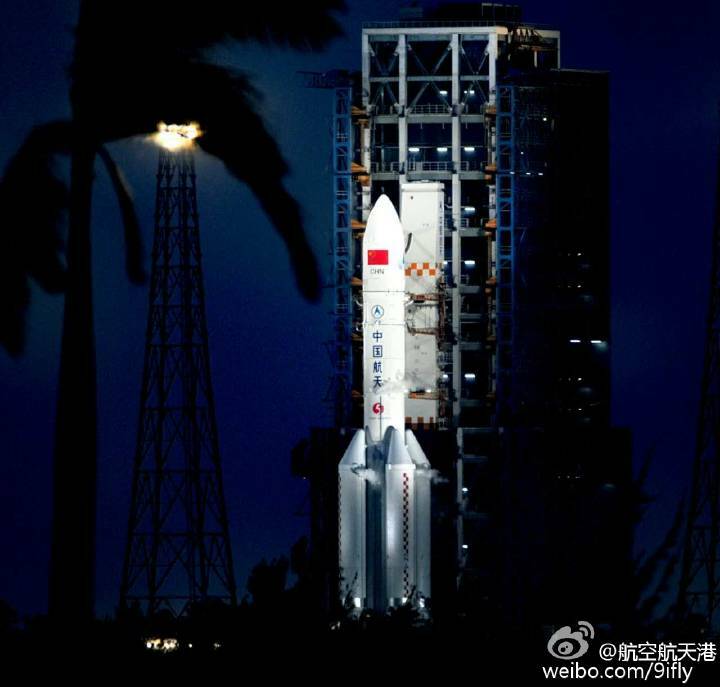 Long March 5 is expected to fly a pair of missions in 2017. A second shakedown mission is planned around mid-year with the Shijian-18 satellite based on China’s next generation Geostationary Satellite Platform. 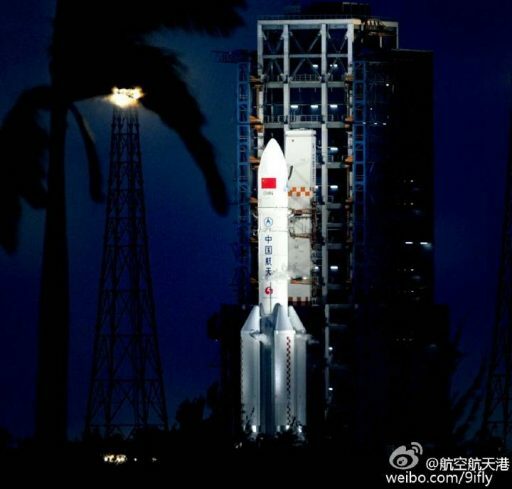 If this mission is a success, Long March 5 will be cleared to launch the Chang’e 5 lunar sample return mission towards the end of 2017 or in 2018.